As the temperatures warm up, I find myself less inclined to spend too much time sewing, but I did manage to complete a couple of projects this week. Sadly, the Sew Out Loud QAL has come to a conclusion with the final block instructions posted last week. Naturally, it wouldn't be a block of mine without something wonky about it! The needle hole should look a whole lot better than that! But, what the heck...I'm leaving it alone. Now I just need to join together the 12 finished blocks, quilt them, and get them hung on the wall in my sewing room. For the second project I completed this week, I used the new fabric collection, Summersville. A couple months ago there was a New York Beauty QAL which I joined and then abandoned after only doing 2 blocks. I loved the blocks, but didn't have a clear idea what I was doing with them! It wasn't until I saw a table runner by Lee here at Freshly Pieced, that I knew what I wanted to do. Thanks Lee! So, here is my New York by way of Summersville! I think I'll also use it to make some new pillows. Finally the thread I've been waiting for has arrived and I can get back to quilting Ocean View and Ironwork*. I'm linking up with Lee and Monika today. Hope everyone has a great sewing week. your New York Beauty table runner is so pretty! I love NYB blocks, but every time I try to make one all my points get cut off. The springy colors you chose are perfect, I particularly like the corally-orange-pinks. I love the NY Beauties! I have got to try one. Gosh!!! 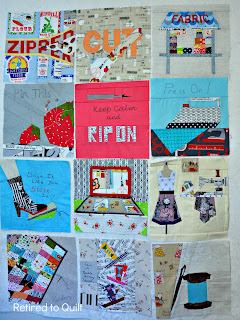 I love it all...your blocks from the QAL are fantastic..just too cute really. And I love your NYB. It is stunning! I'm too scared to brave a NY Beauty, but I do love the block. The QAL blocks are great. I adore the "Drive it like you stole it block." So cute! All the projects you shared are so cute! I especially love the spool of thread block. 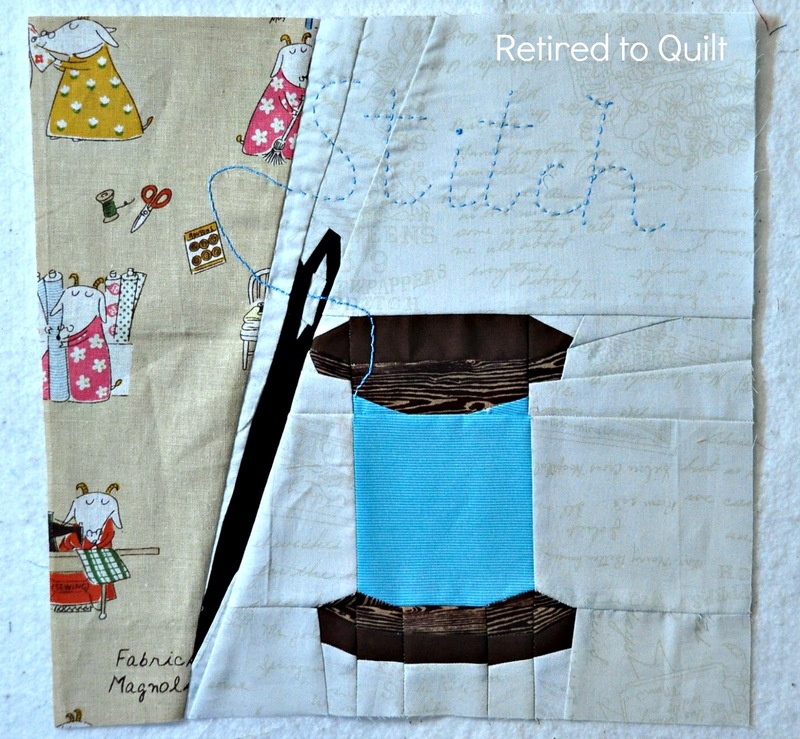 Cant wait to see your finished Sew Out Loud quilt! Those blocks will make an awesome quilt! Way to go on those tiny pieces, Patti! Love your table runner too -- very cool in the Summersville fabric. Hope you'll link it up to TGIFF! this week? Wow! You are all about pointy points. Great stuff! Oh wow, your table runner! It's just gorgeous! And your project really makes the fabric sing. Great idea to use those blocks for a table runner. The Summersville fabrics are very nice for your project. I'd love to have some to play with! 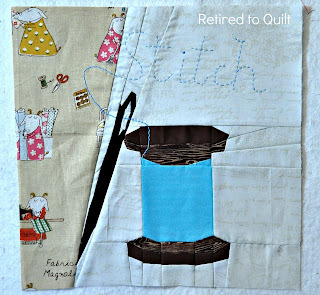 That wall hanging is going to be so cool on your sewing room wall! The piecing alone had to be hard on that table runner. This is amazing! 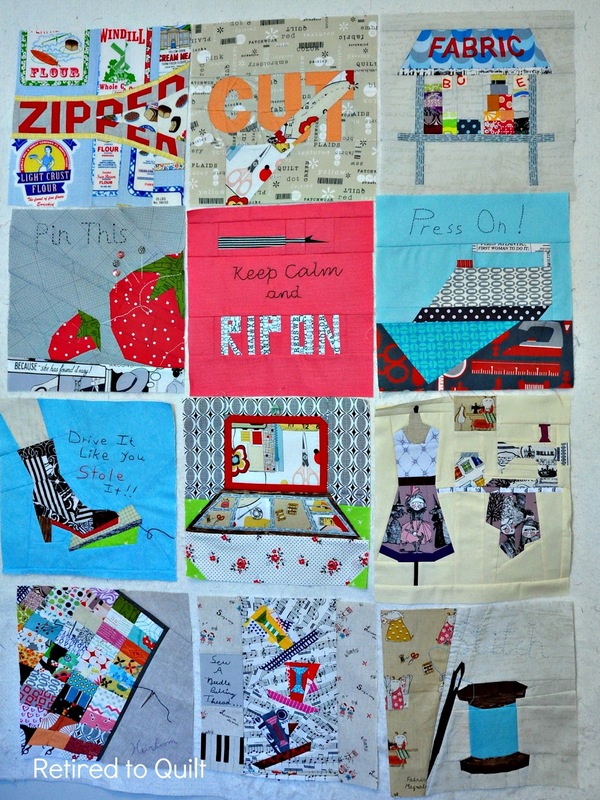 Paper piecing + sewing theme = awesome!